A Good Pilates Routine For Anyone! A Good Pilates Routine to Suit Anyone! A Good Pilates Routine includes all of the basic principles and fundamentals of Pilates exercise. The principles of Pilates include breathing, concentration, focus, flowing movement, centering, and precision of movement. In each exercise that you perform if you follow these principles you will not only get more out of your workout, but also will benefit from increased energy, flexibility, strength, and most importantly, a lower risk for injury. There is a basic fundamental sequence or flow to the Pilates routine or repetoire of exercises. It is what I follow in my classes and works well for my students. I will outline it for you below. 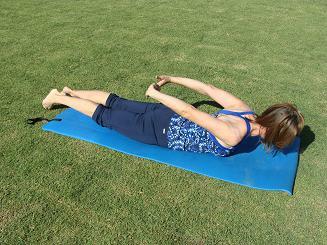 A good warm-up should begin with an articulating type exercise such as the Pilates Bridge or Pelvic Lift. -Begin lying on your back with your knees bent, feet under your knees, and arms long at your side. -Inhale to feel length in your spine and then exhale as you melt your ribs into the mat rolling up through the spine as you press equally through your feet. Feel the hips lifted and level and a stretch in your quadriceps. -Inhale at the top and then exhale to peel the spine back down one vertebra at a time. The Pilates Hundreds, although not popular with my students I stress to them the importance of the breath cycles to work their respiratory muscles and warm up the core. -Begin lying on your back with head and shoulders curled off the mat, arms long and lifted one inch off the floor, and the legs either bent or in a straight leg position. -Pulse the arms up and down energetically as you breath in through the nose and out through the mouth for a 10 count breath cycle. Pulse breath if you can. -Do this for 10 breath cycles in for 5 count and out for 5 count. Add some Single or Double Leg Stretching exercises for more abdominal work here. These are the middle of a good Pilates Routine as they bring you up to sitting and stretch both the lower back and then open the chest. -Sitting tall on your mat with legs extended and arms extended in front of you take a deep breath in. -Exhale as you round forward from the top of the head to the tail making a big "C" curve hollowing your pelvis as you reach towards your toes. -Inhale to stack the spine back up tall. -How to do Pilates Chest Expansion: place your hands behind you with your legs extended as shown in the picture to the right. -Inhale as you press into your hands as you lift your chest upward to the ceiling opening your chest as you draw your shoulder blades together in back. -Exhale to return to a more relaxed position. Side Kicks are important part of the Pilates Routine as they help to balance you in a side position working the muscles at the waist as well as the hip abductors and adductors. -Begin lying on your side with hips and shoulders stacked on top of each other and the waist lengthened or lifted off the mat slightly. -Inhale as you reach your top leg towards the sky pointing your foot and then exhale as you lower reaching out through your heel. -Try adding a heel tap as you lower the top leg in front and then behind the bottom foot. Repeat these 8-12 repetitions on each side. A good Pilates Routine generally finishes with some extension exercises to open the front of the spine and abdomen after all the deep abdominal work. -Begin lying face down on your mat with your forehead on your hands. -Inhale as you extend one leg at a time lifting up through the thigh but not the hip. Exhale to lower. -Or, the exercise to the left can really help with upper back strength and extension. -Focus on your pelvic triangle here keeping your pubic bone gently pressed into the mat to hollow your pelvis and work the deep abdominal muscles. Finish with a nice lower back stretch such as the Shell or Child's Pose. This Pilates Routine should be at least 2 and up to 4 days per week for best results. Leave Pilates Routine and get started today with action in my newly revised Pilates Ebook – Relief for Back and Joint Pain. Find qualified certified Studio's and Instructor's in your area for more expertise and one on one instruction by going here.